This centre is a world famous stadium, home to major sporting and entertainment events. So while the centre is in a thriving environment surrounded by businesses from telecoms, technology, and the media, you’ll also be just a short walk away from stylish restaurants, hotels, and cafés designed to serve stadium visitors – up to 80,000 of them a night. 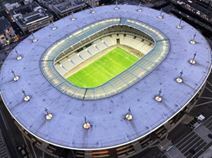 And, following heavy investment to make the stadium easy to reach, you can take the metro to nearby Saint Denis and Paris in minutes, or drive to the A1 motorway for connections to Paris, Brussels, Lille, and Roissy Airport. This centre located in a well known French stadium offers fully furnished serviced offices with all inclusive pricing. Here, you'll get support from an on-site admin team. This team can help with anything you need including; mail handling, telephone answering and greeting your clients. The centre is easily accessible using the local Metro service or mainline Train Station which are both located a short five-minute walk away from the space. The centre benefits from its own on-site cafe but still boasts many local amenities within walking distance of the space.